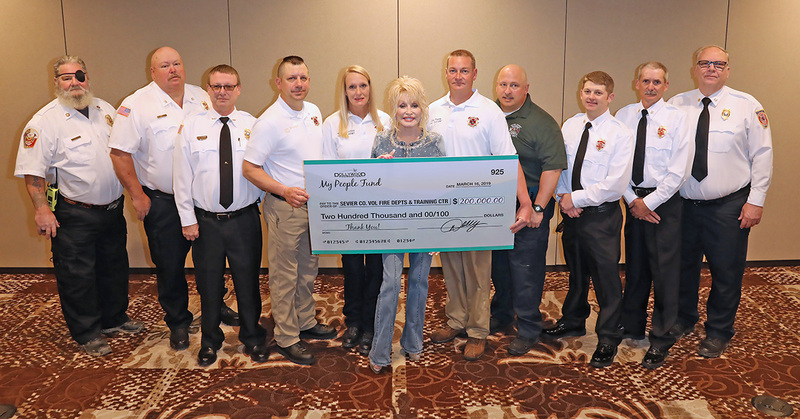 Dolly Parton’s My People Fund donates $200,000 to eight volunteer fire departments and their training center. Tennessee House of Representatives honor Dolly Parton. On Saturday, March 16, Dolly Parton met with all of the Fire Chiefs in Sevier County at Dollywood’s DreamMore Resort and Spa. In recognition of their instrumental role in fighting the 2016 wildfires, The Dollywood Foundation’s My People Fund donated $20,000 to each volunteer fire station and gave $40,000 to their area training center. In total, Dolly presented them with $200,000 for their brave service to the community. “It is only fitting that the last of the My People Fund will go to those who were the first to respond to the fires,” said Dolly Parton. 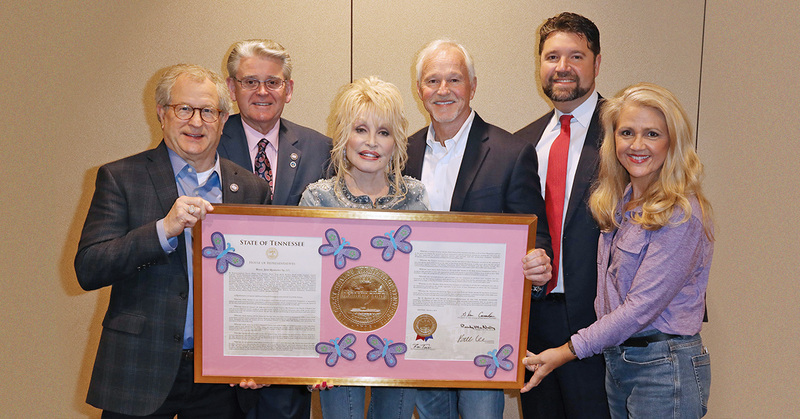 In conjunction with this donation, the Tennessee House of Representatives presented Dolly Parton with a resolution to recognize and honor her as one of Tennessee’s most beloved and accomplished daughters. 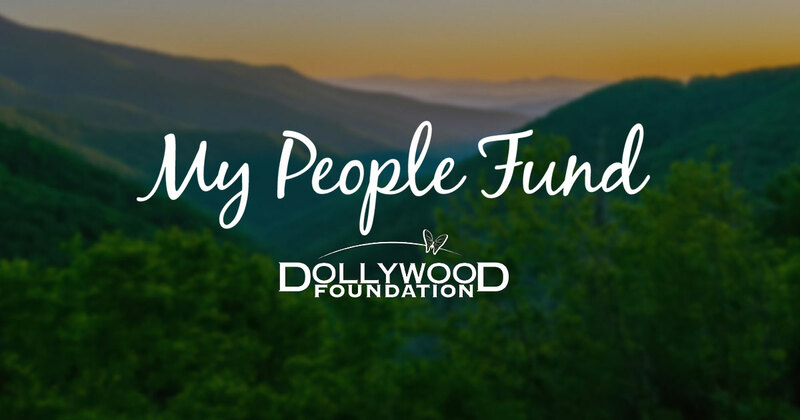 The Dollywood Foundation established the My People Fund just 48 hours after the 2016 wildfires. In the weeks and months following, the Fund provided $1000 each month for six months to Sevier County families whose homes were uninhabitable or were completely destroyed in the Smoky Mountain wildfires. Any family who lost their primary residence (renters and homeowners) due to the wildfires in Sevier County were eligible. Due to the tremendous outpouring of donations and support, the final distribution checks were $5000 (per family). Dolly Parton wins Emmy at the 32nd Midsouth Regional Emmy Awards in the Community Service category for Smoky Mountains Rise. Dolly Parton won alongside collaborators Nicholas E. Dugger, Danny Nozell, Pete Owens, Scott Durand, Shanna Strassberg, Edie Lynn Hoback and John Zarling. During the ceremony, Dolly and the Dollywood Foundation received The Governors’ Award for outstanding achievement in community service. The Board of Governors’ Award is for truly outstanding and unique accomplishments and achievements of some duration and durability. Past recipients include Ralph Emery (1991), NASA TV and Marshall Space Flight Center (2008) and Vanderbilt University News Archive (2012). Congratulations to Dolly for receiving the Governors’ Award for outstanding achievement during the regional Emmys ceremony tonight! We at Dollywood are proud of all you’ve accomplished. 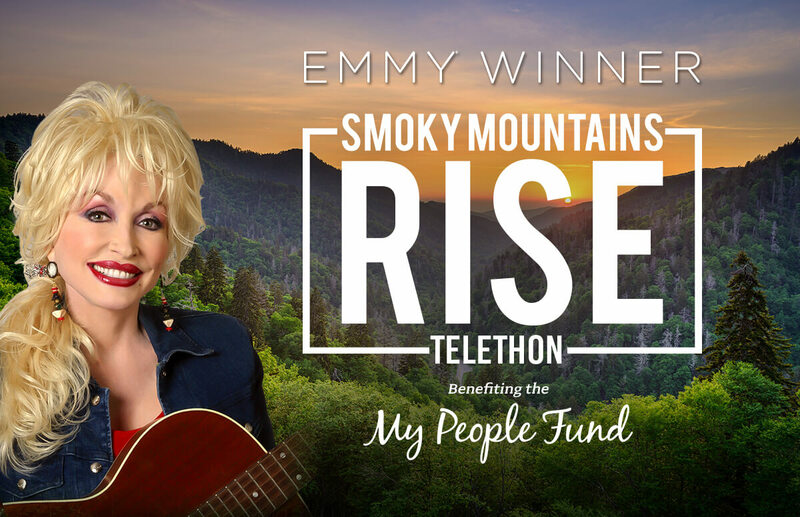 UPDATE Jan. 20 – Dolly Parton wins Emmy at the 32nd Midsouth Regional Emmy Awards in the Community Service category for Smoky Mountains Rise. Dolly Parton is nominated for a 32nd Midsouth Regional Emmy Award in the Community Service category for Smoky Mountains Rise, along with collaborators Nicholas E. Dugger, Danny Nozell, Pete Owens, Scott Durand, Shanna Strassberg, Edie Lynn Hoback and John Zarling. During the ceremony, Dolly and the Dollywood Foundation will receive The Governors’ Award for outstanding achievement in community service. The Board of Governors’ Award is for truly outstanding and unique accomplishments and achievements of some duration and durability. Past recipients include Ralph Emery (1991), NASA TV and Marshall Space Flight Center (2008) and Vanderbilt University News Archive (2012). The event will be streamed live Saturday, January 20, at 8:00 pm Central Time from Nashville’s Music City Center. Sevier County residents who lost their homes in the wildfires received $1000 checks from the My People Fund. One by one, people who lost everything in the Tennessee wildfires are getting a “hand up” in the form of $1000 checks from the Dollywood Foundation’s My People Fund. The Foundation began distributing hundreds of checks on Thursday, Dec. 15. Over the next four business days, the process will continue for those who qualify. To date, nearly $9 million has been raised for the My People Fund and the need is still great. According to the Foundation, the number of people needing help is still unknown. Inside the LeConte Events Center checks are given out in what is called the CARE MORE Assistance Center. In addition to My People Fund checks, Dollar General is on hand giving out toys and gift cards. Tanger Outlets has also generously donated gift cards as well. On Dec. 1, Dolly Parton announced a new effort by The Dollywood Foundation, The Dollywood Company and all her dinner show attractions including Dixie Stampede, Lumberjack Adventure and Pirates Voyage to establish a fund to assist the victims of the Great Smoky Mountain wildfires in Tennessee. The My People Fund will provide $1000 each month for up to six months to Sevier County families who lost their homes. To learn more about My People Fund, get assistance or to make a donation, visit DollywoodFoundation.org. My People Fund assistance checks will be distributed to wildfire survivors beginning Dec. 15. The Dollywood Foundation will begin distributing checks to those affected by the Great Smoky Mountain wildfires on Dec. 15, at 10 a.m. at the CARE MORE Assistance Center inside the LeConte Event Center. More than 900 people have applied for funds, with more expected to complete the application. For efficiency, The Dollywood Foundation encourages only the head of household to report on the day that correlates with their last name. The head of household should be prepared with photo I.D. The Dollywood Foundation emphasizes that funds will not run out. This is the first of six distribution periods. 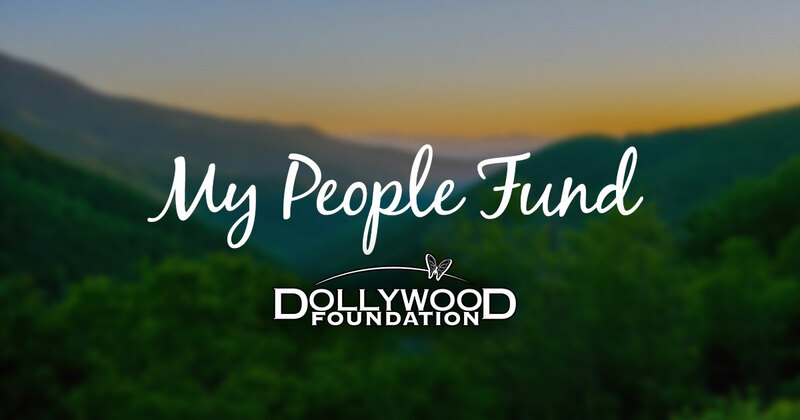 The Dollywood Foundation’s My People Fund was established to assist those families (owners or renters) who lost their primary residence in the wildfires (complete loss or uninhabitable). Eligible families receive $1000 a month for up to six months. Applicants are urged to pre-apply by visiting Dollywood Foundation online. County officials are using the U.S. Geological Survey of the damage and cross-referencing with official documents to ensure the families who lost everything receive these funds.